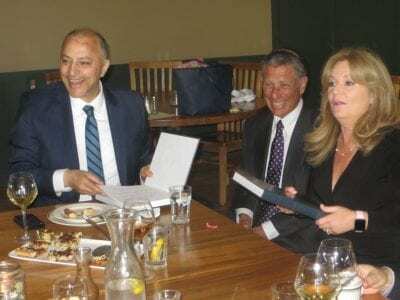 Volumes of the “History of Putnam County” are exchanged at the luncheon, which brings smiles to the faces of Nawaf Salameh, Hal Lepler and County Executive Odell. 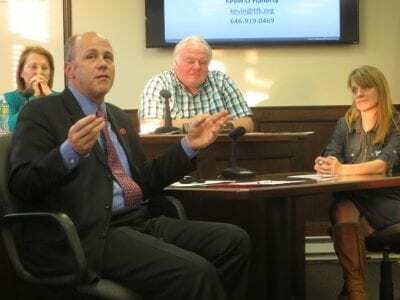 Photo by Eric GrossOne of Putnam County’s most exciting business ventures ever will pla… Please login below or purchase a subscription to the Putnam County Courier to access this content. 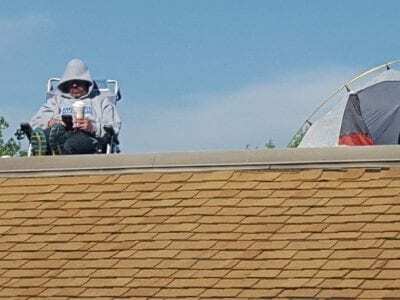 Gary Chadwick takes a cat nap Thursday evening on the roof of the Fulmar Road Elementary School. Photo By Karen ThorntonMahopac’s Fulmar Road Elementary School Principal Gary Chadwick is a glutton for punishment but when kids are involved, Chadwick d… Please login below or purchase a subscription to the Putnam County Courier to access this content. Kevin O’Flaherty and Julie Hart discuss increasing the legal smoking age at last week’s legislature meeting. Legislators Barbara Scuccimarra and Bill Gouldman listen. 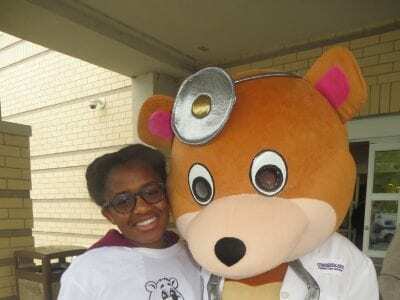 Photo By Eric GrossEighteen-year-olds throughout Putnam County currently have the r… Please login below or purchase a subscription to the Putnam County Courier to access this content. Inside the Big Buddha Hall, attendees of all faiths, religions and ethnicities prayed while bathing the Baby Buddha. 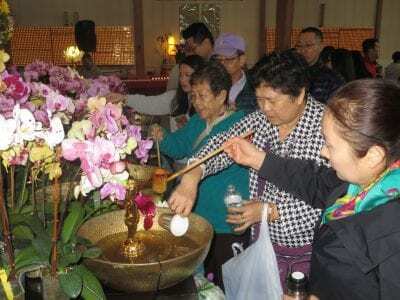 Photos by Eric GrossMother’s Day was celebrated in special fashion at the Chuang Yen Monastery in Kent Cliffs Sunday when hundreds of… Please login below or purchase a subscription to the Putnam County Courier to access this content. Syracuse softball standout Sammy Fernandez has set a handful of school records for the Orange softball team during her time at the school. Photo courtesy of Syracuse AthleticsSYRACUSE – Former Carmel High School softball standout Sammy Fernandez is s… Please login below or purchase a subscription to the Putnam County Courier to access this content. Tues May 15-12pm Chat ‘n’ Chill at Patterson Lib. More info/reg: 845-878-6121 x10, pattersonlibrary.org Wed May 16-7pm ‘Solar Energy Options’ at Patterson Lib. More info/reg: 845-878-6121 x10, pattersonlibrary.org Wed May 16-7pm Breast & Ovarian … Please login below or purchase a subscription to the Putnam County Courier to access this content. Richard Harrison’s Wonder of Cats is on display this month at the Kent Public Library. Photo by Richard HarrisonCat lovers rejoice! 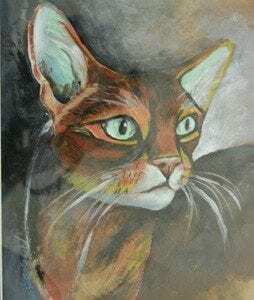 Eleven portraits of magnificent felines are on display this month at the Kent Public Library thanks to photographer, a… Please login below or purchase a subscription to the Putnam County Courier to access this content. 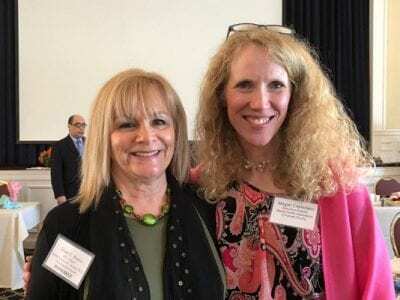 Diane Russo (left) is lauded by Megan Castellano at the recognition breakfast. Photo by Jackie StefanakDiane Russo has spent her entire life improving the lives of those facing mental health and substance abuse issues. Russo, CEO of CoveCare, was hon… Please login below or purchase a subscription to the Putnam County Courier to access this content. Polls opened at six this morning and will remain open until nine tonight in school districts across Putnam County, as residents are going to the polls to decide the fate of school budgets for the 2018-19 school year in addition to electing members to… Please login below or purchase a subscription to the Putnam County Courier to access this content.